There’s so much information on the internet these days, and even more so when it comes to video game rumors. With so many « leaks » flying around and nephews whose uncles work at Nintendo, it’s hard to tell what’s real sometimes. 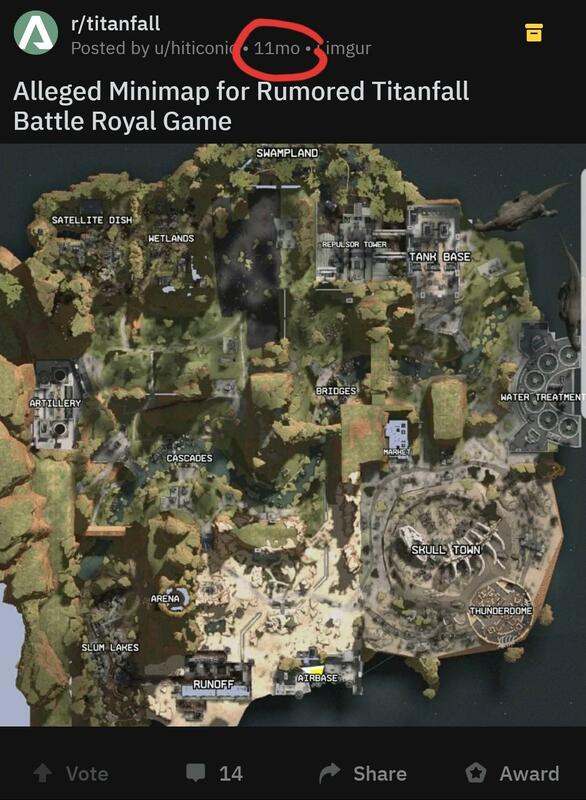 Like a year ago, for example, when the actual map for Apex Legends was leaked on Reddit and nobody believed it was real. 11 months ago, user u/hiticonic posted a leaked version of the Apex Legends map on the r/Titanfall subreddit. There are some differences, presumably since it was still a work-in-progress at the time, but it’s clearly a version of the same map Apex Legends launched with. Unfortunately, nobody believed u/hiticonic when the leak went live. As it turns out, the original poster from 11 months ago, u/hiticonic, is a mod on the r/ApexLegends subreddit. This has led to speculation that the leak was intentional and was a way for Respawn to gauge interest from fans. Given the cold reception at the time, it might have led to Respawn’s decision to launch Apex Legends without a prior announcement. While we may never know the origins behind the Apex Legends leak from a year ago, it’s crazy to see how reception to a Titanfall battle royale game didn’t really change until launch. Even when Apex Legends leaked a weekend before the release, the idea of a Titanfall battle royale spinoff was met with derision. But history has vindicated u/hiticonic it seems. Check out our Apex Legends FAQ for more info, including tips and tricks.